How much will the transformation of the German energy industry cost if it is to reach greenhouse gas emissions reductions of at least 80 % by 2050? The German Institute Fraunhofer ISE used its Renewable Energy Model REMod-D for Germany 2050 to perform the simulations necessary to answer this key question. REMod-D considers all kinds of energy end-use applications (in manufacturing, transport and residential segments) and each and every energy technology. Simulations are performed on an hourly basis to ensure the security of supply in all industries throughout the year. The studied scenarios differ with regard to drive concepts used in the private and commercial transport industry, the extent of energy retrofits in the building industry and the exact time at which coal will no longer be used to generate electricity. The most recent REMod-D study, which was published in November 2015, was called “What Will the Energy Transformation Cost? Pathways for Transforming the German Energy System by 2050”. Solarthermalworld.org spoke with Sebastian Herkel from Fraunhofer ISE about the study’s solar thermal outcomes and the use of REMod-D in urban planning scenarios of Task 52 of the IEA Solar Heating and Cooling Programme. Solarthermalworld: REMod-D maps the entire German energy industry – including electricity and heat – and can simulate hour-by-hour development over more than 30 years. How did you develop such a complex model? Herkel: We began in 2010 by writing the first basic version and using data from the IEA’s Energy Outlook study for Germany. The model was written in an object-oriented programming language, with scripting language employed for data analysis and visualisation. It took several man-years to improve the tool, and the study from November 2015 has already been the third one based on REMod-D. Our simulations do not forecast, but only investigate what happens when you change or transform certain framework conditions. Germany’s solar thermal share by 2050 across four different scenarios calculated based on the Renewable Energy Model (REMod-D). Solarthermalworld: The chart above shows the solar thermal potential across different scenarios. What are the key factors that impact modelling results the most? Herkel: The most influential factor is the CO2 reduction targets. If we aim at higher CO2 emission reduction, say 85 % instead of 80 %, the transformation of the energy industry becomes more expensive and the carbon-free solar heating and cooling technologies play a larger role (see scenario 3). The time frame to exit out of coal power generation has great impact as well. In the event of an early coal exit – as in scenario number 2 in the chart above – there is much less pressure on the heating sector to decarbonise and much less capacity available for solar thermal. Solarthermalworld: Is cost optimisation the focal point of the study? Herkel: Yes, the model aims at finding the lowest total cost for a transformation of the energy industry. It does take the individual business models of market actors into account, but assumes that the market will be organised so as to effect overall cost minimisation. We very well know that people in the real world behave differently. However, this analysis provides clarity about what solutions are possible from a technological point of view. Our approach uses technologies if they are most economical in reducing CO2 during a certain period. Solar heating systems are often put on hold because they are not self-sufficient heating systems like a heat pump, a monovalent system which can supply heat and hot water to a building. REMod-D estimates on the cost reduction potential of different solar heating technologies. *Specific costs for solar process heat in 2050 were a speculative estimate by the authors of the study, since no data was available. Solarthermalworld: Long-time cost reduction curves for solar heat have obviously had a strong impact on evaluations of efficiency. How did you arrive at these assumptions and what is the impact of cost reductions? Herkel: The data for this kind of study – especially if it spans over such a long period until 2050 – is always just a best guess. We already know something on the actual cost share between materials, components, distribution and maintenance for solar thermal solutions in the building industry. The market for solar process heat is far less mature, so there is less information available. The impact of different parameters like cost curves for technology: This is one of the issues we will investigate as part of a TASK 52 project, Solar Heat and Energy Economics in Urban Environments. 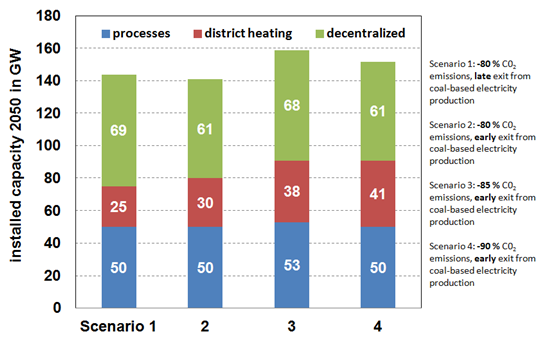 Another interesting question in relation to energy supply in urban environments is the share between district heating and solutions for single-family buildings. We will use REMod-D to calculate different scenarios here. Solarthermalworld: Hans-Martin Henning, the lead author of the study, made a provocative remark during a German conference in May: He said that solar thermal was an optional technology for the decarbonisation of the German energy industry and that this decarbonisation could as well be achieved without solar heat. How did he arrive at this conclusion? 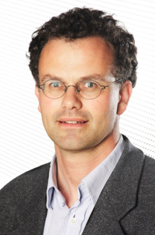 Herkel: First of all, I would like to emphasise that the cost-optimised scenario is always a rather flat one, meaning that there is a plain in the multi-dimensional result hyperplane and different scenarios wind up with almost the same cumulated costs and the same level of decarbonisation. We noted that some of the scenarios on this plain include solar thermal technologies and others don´t. This is where the statement by Hans-Martin Henning comes in. You can achieve a cost-optimised scenario with or without relying on solar heating technologies. Solar heat is an optional and not a mandatory technology, whereas wind and photovoltaics, as well as combined heat and power plants are mandatory to get to an 80 % target at the lowest cost. Solarthermalworld: Electrification of the heating industry is an often-mentioned trend. How do your scenarios incorporate it? Herkel: Electrification of the heating industry is indeed inevitable. Particularly because we assume a potential of biomass usage in REMod-D limited to today’s level and also because we excluded imports of biomass or biofuels. To achieve high decarbonisation rates, we absolutely need renewable electricity in the heating and transport segment. In the building industry, a solution low on CO2 consists of a condensing gas boiler combined with a solar thermal system or a heat pump combined with a photovoltaic generator. In scenarios that aim to reduce CO2 by up to 80 %, the latter solution mostly beats the competition. Still, it is interesting to look at the 85 % or 90 % scenarios, in which renewable electricity is increasingly used to produce synthetic fuels through electrolysis and in some scenarios, there is further conversion of hydrogen into synthetic methane or liquid fuels. These scenarios make solar thermal significantly more important and economically feasible. The interview was conducted by Bärbel Epp.